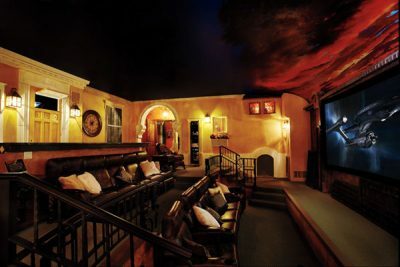 While always intriguing, one wonders if homeowners eventually tire of highly specific themed theaters. One-off theaters, like those designed by Mario Panelli Studios, never grow old. They are inviting and welcoming spaces that reflect the design and lifestyle sensibilities of the homeowner. You are wowed by the timeless beauty and fine detail, which effectively captures the homeowner’s tastes and personality. This relationship that begins with the consultation, and is carried out well beyond the completion of the project, is paramount to ensure that all aspects of the project are not only visually stunning, but that they met all the acoustical requirements needed to make the room sound as terrific as it looks. This latest theater from MP Studios was built into a new gaming annex that was added to the backside of the property, with the theater portion being 16’ wide by 19.5’ deep. The unique ceiling concept was presented to the client as a physical scale model. Due to the level of trust developed between the client and designer, many elements were altered on-the-fly during construction without further client approval. The theater’s ceiling is a totally self-supported structure and is not connected to the actual ceiling except at the sides of the soffit. The room design took a month to design and engineer, with another 10 months to build it out and install all the AV gear. The theater itself is independent of the other home systems, except for the smoke detector and intercom. The equipment rack is hidden behind one of the back wall sculpture panels and contains all the electronics including a NAD 775 7.1 Surround Receiver and several source devices. Axiom Speakers were used throughout with M60 V3’s used for the main left and right speakers, a VP180 for the center and QS4’s for the sides and surrounds. The video side of the equation included the pairing of the Runco LS-5 DLP Projector and a Dalite Pro Imager screen with horizontal masking. The screen is 54”x126” and configured in the ever more popular 2:35 format. The room was outfitted with 54 light fixtures (total of 7000 watts) using Lutron Homeworks Lighting Control system. The fixtures were grouped into 12 dimmer switches for extremely selective lighting control. Creating a more informal atmosphere, only the front row of the theater has four theater seats. The back row is essentially a wall to wall couch, for a more cozy interaction between friends and guests. Perhaps, the biggest challenge was the entry door, which was designed to disappear when closed and there’s not even a visible handle. A sound dampening panel was hung from the inside of the door. Two lighting fixtures were added to match the other five panels on the sides of the theater. To complete the effect, a down-lit baseboard was placed at the bottom of the door, which was no easy task according to Clowes. Spring- loaded conduit was used to assure the wires would work for many years without requiring maintenance. Visitors can mosey through the “shops”, chat in the courtyard and loose themselves in this quaint setting. When showtime comes, they enter the theater through two large wooden doors into an ornate and spacious area that seats eighteen. The overall size of the street area is 21 x 43 feet with the actual theater measuring approximately 27 x 36 feet. In an effort to make the visual experience in the street appear authentic, Potter used a number of techniques. The building exteriors were plastered, then several layers of paint were applied using 3-4 different colors, creating a feeling that decades worth of maintenance and change had taken place. Utilizing a technique of his own, Potter aged the surfaces to imitate the effects of natural weather conditions. Posters were painted to further create the illusion of a specific time period. For a sense of depth, buildings in the front were painted lighter than the buildings in the back. The final touch is five zones of lighting, with the street lighting capable of representing different times of the day. Once seated in this grand theater, you’re treated to a no-compromise cinematic experience featuring high-end audio components and a 2.35:1 image. For reference quality 7.1 multichannel audio, all Classé Delta Series products were installed including the SSP-880 AV surround processor along with the CA-3200, CA-2200, and CA-2100 power amplifiers, which drive PSB CW383 reference in-wall speakers and CHS212 reference subwoofers. On the video side, a Runco VX44D-CWAS 2:35:1 Cinewide 1080p projector was paired with a Stewart 165″ Cinecurve Firehawk cinemascope projection screen. The projector is capable of brightness levels several times that of most projectors and the curved screen rejects ambient light while reflecting the projected image evenly to all seats, providing exceptional corner focus compared to flat screens. Additionally, the curved screen, along with an anamorphic lens attached to the projector, displays movies in their original widescreen aspect ratio while utilizing the full resolution of the projector, ensuring optimum image quality. To hide the Runco projector from view, a custom mounting system was fabricated to place the projector vertically behind a faux building facade. The image is reflected off of an observatory telescope grade mirror and then through a 5” x 12” aperture in the building door. A custom cooling enclosure ensures silent and cool projector operation. The theater’s equipment rack was located outside in one of the themed rooms with other whole-house equipment placed in a different room. For simple control from any location, a Crestron’s DM “Digital Media” ADMS Media Server was installed, which shared all the video sources with the theater and the rest of the house. A Crestron TPS-6X wireless RF 5.7” touchpanel is used in the theater to access media as well as control the AV gear, lighting and climate. An auxiliary TPS-6L wall-mounted touchpanel was installed just outside the theater for whole-house control. 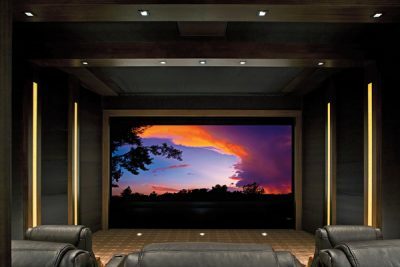 Prather Warren, owner of Innovative Home Media (IHM), had no idea what he’d signed up for when he agreed to take Triad’s CinemaPlus demo theater after the 2009 CEDIA Expo. It’s not uncommon for manufacturer’s to sell off some demo gear after a trade show so they don’t have to ship it back to the factory…but a whole room? A long time AV enthusiast, Prather founded IHM in 2006. However, the one thing he needed to take his high-end custom AV business to another level was a demo theater. To that end, he had plans drawn to add a floor to his house for a dedicated theater. As he was preparing to built-out the new space, a fortuitous discussion with Bill Ruark, a sales consultant with Triad Speakers, caused him to alter his plans. Ruark felt that Triad’s CinemaPlus program might be the perfect solution for Prather’s new theater. CinemaPlus is a partnership between American-based Triad Speakers and PMI, Ltd., the company founded by Anthony Grimani, formerly of THX and Dolby. This partnership provides unprecedented support, expertise and resources for custom installation firms like IHM, allowing them to create theaters with performance levels well above the typical theater. 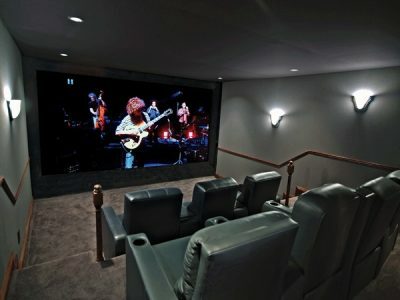 A CinemaPlus system consists of a complete high-end Triad multichannel speaker system that is custom designed for the specific room, including a full one-off plan drawn up by PMI. At this point, the theater changed in scope focusing on a CinemaPlus system. 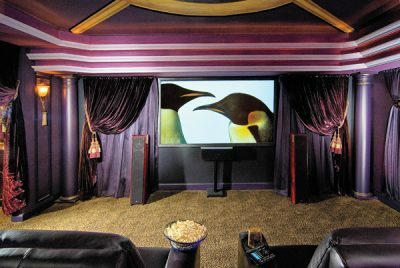 Again fortune intervened and Ruark informed Prather that Triad and PMI were planning to build a fully-engineered, ground-up, CinemaPlus demo theater room on the show floor of CEDIA in Atlanta, and asked if he would be interested in purchasing “some” of the system after the show was over. Prather ended up flying into Atlanta a few days early to offer his expertise in what turned out to be an over-the-top demo. With theater seating, this would have cost about $400,000 if purchased at retail. Ultimately, Prather purchased a good deal of the components, speakers, acoustical treatments, cabling and all of the sound isolation materials. After four days of continuous and impressive demos at the expo, the room had to be taken down carefully, all the gear packed properly, and somehow get it to Prather’s home in Baton Rouge, over 525 miles away. A dozen people worked for two days to unscrew drywall, pack amplifiers and speakers, coil wire, and disassemble the Triad BaffleWalls. The estimate of the total weight was at least 25,000 lbs., requiring an 18-wheeler to make the long haul to Louisiana. After arriving in Baton Rouge, the shipping crates and pallets were loaded into smaller trucks and transported to Prather’s home. The shipment was large enough to fill his carport, back porch, courtyard, and a good deal of the driveway. Over the course of the next six months the materials were continuously sorted and rearranged to locate the pieces and parts that were needed as the project progressed. Moreover, everything had to be carried up a flight of steps since the theater was upstairs. The actual construction of the room was anything but typical. In order to achieve a room that was perfectly quiet, the walls ended up being 13” thick including acoustical foam and several soundproofing materials from QuietRock (quietrock.com). The floor consists of 2 x 12s on 10″ centers designed to support the load. Rubber isolating material was placed on top of a 1-1/4″ layer of plywood flooring along with QuietWood and mass-loaded vinyl. All the seams were filled with QuietSeal. The finished measurements of the theater were 16′ 4″ wide and 23′ 6″ deep. An 18″ tall riser, 10′ deep, extended across the room and 50% filled with rock wool. The upper surface consisted of two layers of 3/4″ plywood, then sealed and glued with QuietGlue. When the frequency response was measured, it was determined that 3/8″ diameter holes (1,523 of them) drilled across the entire top of the deck would naturally attenuate peaks at 45 and 63 Hz. An extensive rattle test was performed, however, absolutely everything had been glued and screwed together, leaving few issues to address. The air handling capacity of the HVACs supply and return grills was implemented utilizing three times the surface area that would normally be specified for the number of cubic feet in this room, rendering it virtually silent. Terry Hill of PMI spent a week applying the finishing touches including the projector housing and installation of a 300 lb. QuietDoor. Robbie Burns of Better Acoustic stepped in and installed the acoustically transparent fabric on the walls and ceiling, hiding all the acoustical materials and wall mounted speakers. While the CEDIA attendees were wowed by the Triad demo, they missed the truly insane part of the story, which was disassembling an entire room, board by board and screw by screw, transporting it 525 miles, and then re-engineering and reassembling it into a world-class home theater.